From now until May 31st you can submit name ideas through a number of various outlets. You can go to Twitter and tweet your ideas to @SaturnineGames and @Nintendo_Okie. Be sure to include #nametheturtle in your post. 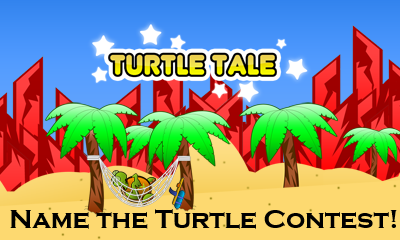 You can send an email to nametheturtle@nintendo-okie.com. If you’ve got a Facebook account you can go to the Saturnine Games page or the Nintendo Okie Facebook Group and submit your ideas there. Entries can be submitted through all of the various means, but please don’t spam the same name to them all, be creative. Anyone can enter, but if you live in North America and happen to be one of their favorite entries, you’ll also get a free download code for their excellent game Antipole. And I’m not just saying that…when I got the chance to curate my own shelf in the 3DS eShop last summer, this was one of my selections. Here’s why, if you don’t remember. It’s pretty awesome. Anyway, that’s all…just wanted to pass on the information. Now get turtle namin’!